The Second Judicial District Commission on Judicial Performance, on a vote of 10-0, recommends that Judge Elizabeth Anne Starrs BE RETAINED. The governor appointed Elizabeth Anne Starrs to the bench in July 2012. Before her appointment, Judge Starrs was an attorney in private practice running her own firm. 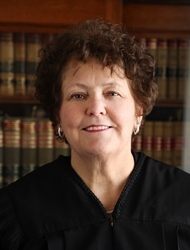 Judge Starrs earned an undergraduate degree in Communications from the University of Michigan in 1975 and her law degree from Suffolk University in 1980. Judge Starrs received an overall combined average rating which exceeded the average combined rating of all district court judges standing for retention. Her marks in case management, demeanor, and communications among attorney respondents were higher than other district court judges, whereas her scores for diligence and application of the law were average or slightly higher. Non-Attorney surveys rated Judge Starrs higher than average for fairness, communication, and demeanor. Her scores for diligence and application of the law were average or slightly below average. During her interview with the commission, Judge Starrs indicated she wished to improve her survey results in the future. Numerous written comments indicate Judge Starrs has an excellent courtroom demeanor, is fair, and exhibits good docket management.